They ask Him questions and listen intently to His answers. There is something about this young Jewish rabbi that draws us to Him. We know that this man speaks the truth. We must give serious thought to his words. 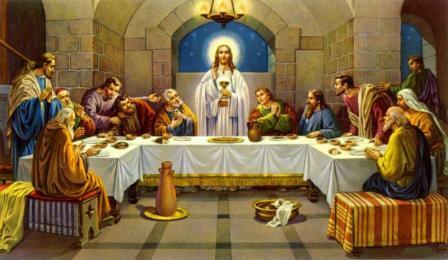 Jesus is here with His twelve apostles to share the Passover meal. We see Jesus seated at the center of a long banquet table. The apostle Peter sits at his right side and John at his left side. The ten other apostles, including Judas, are also seated at the table and talking to each other. Jesus now begins to speak and the talking stops. He says that the Son of Man will be handed over to the authorities and be put to death. In a very sad voice, Jesus tells them that one of those at the table will betray Him. Suddenly there is an outburst of agitated voices. Tears come to our eyes. Surely these things will not come to pass? 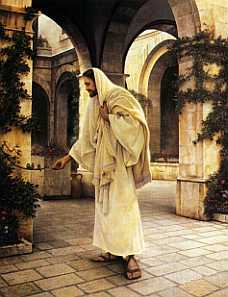 Jesus then says “Do this in memory of me.” A hymn is sung and Jesus and the apostles depart for the Mount of Olives. The upper room is now empty. He is telling us that we are to unite ourselves to Him. The Mass is a re-enactment of this sacred meal and is the most important part of our worship. The Eucharist is not just a symbol, but is actually Jesus under the appearance of consecrated bread and wine. What a staggering reality. On receiving the Eucharist, God is so very real and so very close. Communion must be seen as Christ giving Himself to us — something He did during His whole life. The question we must now answer is, do we really believe that Jesus is actually present under the appearance of consecrated bread and wine?